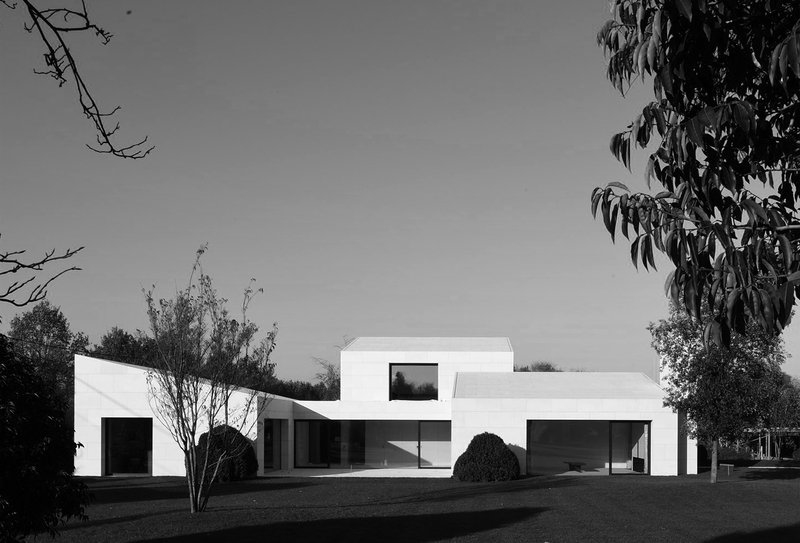 In rural Flanders, surrounded by typical farms with their functional barns and gabled roofs, a modernist residence is integrated through the use of sloping roofs for its three fragmented volumes. The rational, contemporary approach is accentuated and experienced by its Cubist, volumetric design, strengthened by the natural white stone cladding of both façades and roofs which eschew all ornamental elements. From the entrance hall, the house is opened up to the rural landscape through beautiful panoramic windows, arranged around a semi-enclosed central courtyard-terrace, which allows the owners to live inside and out, protected from the harsh winds but taking advantage of the best possible orientation. The white stone continuing from the hall to the outside puts emphasis on the axis with connection to the poolhouse and adjacent water feature beyond. The soft interior palette, mainly consisting of the same white stone, with bleached oak and plaster finishes, preserves the serene atmosphere of the house in its surroundings. This gentle mood is complemented by the use of several bespoke furniture pieces in American walnut, to suit the owners’ international lifestyle.